We loved this hostel. The staff was friendly and very helpful. Would definitely come back here. I had an amazing stay at Jorplace! I only stayed one night since I had to do research for university but still had a great time! The location, the atmosphere, the staff and the price are very good in my opinion! The beach is really close by and there are many nice other bars and things around Jorplace! Overall a very good experience, really recommend this place if you're looking for something affordable but nice in Scheveningen. its was a really great location, close to the beach and the port. love the people who worked there they where very supportive and told me alot what i could do there. definitly will come back at one point. Very nice Hostel with a perfect location. Clean rooms and friendly staff. Very nice place with great atmosphere and friendly staff. Would recommend! 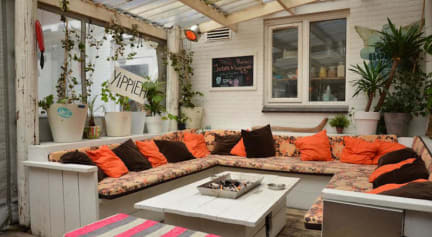 Lovely friendly hostel near the beach in the Hague, easily accessible by the tram system. The 24 bed room was basic but comfortable enough, only thing is they could do with a couple more bathrooms. The dorms seem very small . Lots of common areas. The kitchen was small but well equipped. The other common areas were nice. Unfortunately during low season the level of service was not great. Reception was unmanned many times and it was hard to even get a coffee/check-out at times. In the end, I could not leave my bags for the day as the woman behind reception said she was just gonna close the hostel in the afternoon. You'll probably have a better experience during high season. Have a horrible experience staying in that place. First of all, a 7-bed dorm is so small that you have no space to stay when all people are in. Second, you can sit straight on your bed because there's not enough room between your bed and a bed above you. So all you can do in a dorm is staying (when others are out) or lying. There are two toilets and only one shower (!) for all dorms on the first floor. And no hairdryers. No sound insulation at all. The only location is great - near the sea! We aren't allowed to check in after 10pm, as there will be no staff at the reception afterwards.We've paid a downpayment of l0.65 via website. Upon booking confirmation, we were informed that, we've left 69.25 incl tax to be paid upon arrival. However we were charge full upon arrival. According to jorplace, the downpayment was paid to hostelworld instead. My friend was responded rudely when asking for restaurants recommendations. The room has plug point only the first tier.